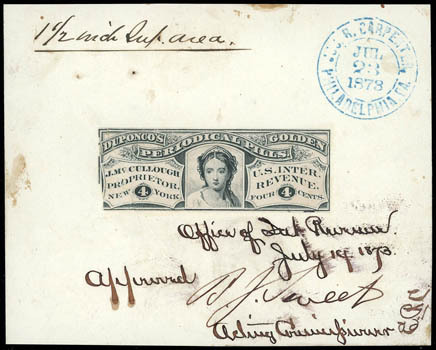 Howe, S.D., 4¢ black, large die proof, approval proof on India, cut-to-shape and mounted on card (94x75mm), with manuscript "Approved, July 14, 1873" approval date and "Office of Internal Revenue, B.J. Sweet, Acting Commissioner" signature of Commissioner of Internal Revenue, with blue "Jos. R. Carpenter, Philadelphia, Pa., Jul 23, 1873" cds, Very Fine, a unique approval proof, ex-Joyce. Scott No. RS134P1 Estimate $1,000 - 1,500. Howe, S.D., 4¢ black, large die proof, on India, stamp size with large oversized margins, fresh and pristine, Very Fine and choice. Howe, S.D., 4¢ black, old paper, strong color, Very Fine, a scarce sound stamp. Howe, S.D., 4¢ black, silk paper, well centered, small thin and some slight toning, otherwise Very Fine. Howe, S.D., 4¢ red & 4¢ green, silk paper, unissued, 4¢ red with repaired vertical separation, 4¢ green with vertical crease, Fine appearance. Howe, S.D., 4¢ blue, watermarked USIR, well centered for this notoriously off-centered issue, rich color, filled thin at right, otherwise Very Fine, rare and grossly undercataloged in Scott, with only 24 examples reported.